World War II transformed the United States Armed Forces from essentially all-male to mixed-gender forces. Because of the severe need to free as many male soldiers as possible for combat, Congresswoman Edith Nurse Rogers introduced a bill in May 1941 calling for the creation of an all-volunteer woman’s corps in the Army. 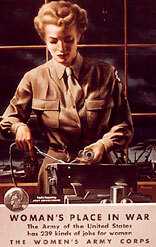 In May 1942, Congress approved a bill creating the Women’s Army Auxiliary Corps (WAAC). Although the women who joined considered themselves in the Army, technically they were civilians working with the Army until 1943 when a new congressional bill transformed the WAAC to the Women’s Army Corps (WAC), giving Army women military status. Women enlisted “for the duration plus six months”. They served not only in the Army (WAC), but also with the Navy (WAVES) and Coast Guard (SPARs). Although never officially members of the armed forces, Women Air Force Service Pilots (WASPs) provided critical support for the war effort. The Marines adopted the concept in 1943 and the public anticipated a catchy nickname like “Femarines” or “Glamarines”, but the Commandant in a March 1944 issue of Life magazine, announced, “They are Marines. They don’t have a nickname and they don’t need one. They get their basic training in a Marine atmosphere at a Marine post. They inherit the traditions of Marines. They are Marines.” In practice, they were usually called Women Reservists, shortened to WRs. During the war, almost 400,000 women served in and with the armed forces—a number that exceeded total male troop strength in 1939. By the end of the war, there were few noncombatant jobs in which women did not serve. Women earned Purple Hearts, Bronze Stars and Legions of Merit. Some were held as prisoners of war and some died in the service of their country. Commanders who had once stated that they would accept women “over my dead body” quickly welcomed them and asked for more. Gen. Eisenhower told Congress after the war, that when the formation of women’s units was first proposed, “I was violently against it.” Then he added, “Every phase of the record they compiled during the war convinced me of the error of my first reaction.” Eisenhower went on to fight for a permanent place for women in the US Armed Forces. At the Parade today we pay special tribute to the memory of Malvern residents Jan Ridenour, who served as a WAVE and Suzanne Froio who served as a WAC in World War II. Information provided by the Women in Military Service for America Memorial Foundation.